If you care about preventing child labor, battling fossil fuels, and sustainable business practices, read on about how your purchase of fair-trade rubber gloves impacts these issues. Rubber or latex milk actually comes from the sap of a tree and is “tapped”, and has to be treated to prevent spoilage. The process is similar to cheese making: the milk is coagulated, an acid is added, and the mass is pressed, extracting the liquid, to form thin sheets of latex. The sheets are then dried by hanging or smoking- with the latter practice being avoided in fair rubber production because of the harmful health risks to workers. Rubber originates from the Amazon rain forest and had been extracted and used by indigenous peoples of the Amazon and Congo. However with the advent of commercial use and the vulcanization process, turning rubber into a more durable product, the growth of the plantation happened. An estimated 70,000 seedlings were taken from the Amazon by Great Britain, on a questionable legal basis, becoming the basis of rubber “plantations” in South and South East Asia. Rubber was used in the production of tires, and at the turn of the nineteenth century there were over a million cars globally, and 7 million bicycles, all helping increase demand. Along with the world wars, the demand for rubber had increased, which led to research efforts to create a synthetic rubber. However for premium products, the tires on jet planes and hot water bottles only natural rubber is used. All of this innovation and growth fueling large-scale rubber production came at a cost. The indigenous peoples were forced to tap rubber and meet strict daily quotas. If they failed to meet daily tapping “targets” they were maimed and slaughtered. Over 30,000 people from the Amazon were killed in this race to source the most rubber. This is why organizations like fair-rubber exist today, to ensure that farmers have ethical working conditions, wages, and resources to sustain their communities and families. A premium is added on top of the current rate of rubber to help farmers build schools, water systems, and sustainable farms. The premium can be used for whatever the individual farmer deems necessary, with minimal parameters. The market price of rubber has been relatively low compared with historic levels of production and demand, making it difficult for farmers to make a living wage. Which forces a lot of farmers out of the trade, and then they cut down the rubber trees and plant palm trees. This is the option that fair rubber tries to avoid because rubber trees suppress a large amount of fossil fuels, making it one of the best stewards of our ecosystem. Check out ifyoucare.com and read the stories as well as all the links with detailed information and the impact the organization is making. 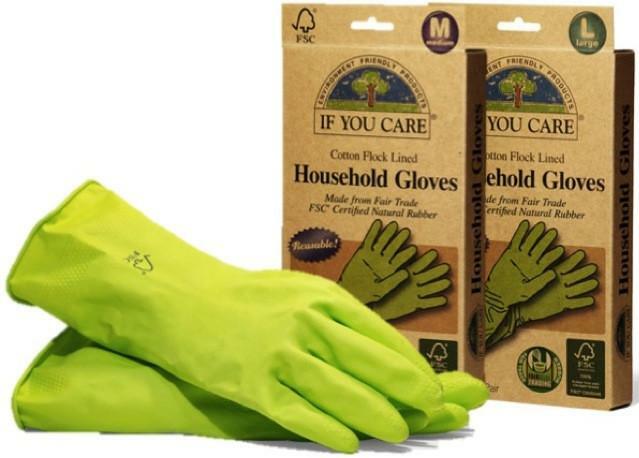 You can get a pair of the If You Care gloves at the Co-Op! Kiya Jamison does odds and ends at the Co-Op, lately with the communications team. She is a Chef and Tango dancer and you can follow her on Instagram @rukiyajamison, @kiyasdelicias.